Bhimashankar, one of the twelve Jyotirlingas, can certainly be termed as a Pilgrim Paradise. The dense forests surrounding the high ranges also play an abode to the rare species of flora and fauna. Situated at the extreme end of the Sahayadri Ranges, this place gives a wonderful view of the world around you. Bhimashankaris located in the village of Bhorgiri 50 km north west of Khed, near Pune. It is located 110 km away from Pune in the Ghat region of the Sahyadri hills. Bhimashankar is also the source of the Bhima river, which flows south east and merges with the Krishna river near Raichur. 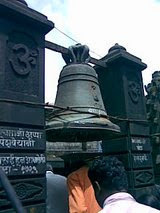 The other Jyotirlinga shrines in Maharashtra are Tryambakeshwar and Grishneshwar. 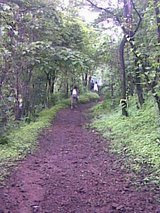 Regular pilgrims near Mumbai visit Bhimashankar from Karjat via Khandas. white line in above pic is the way .